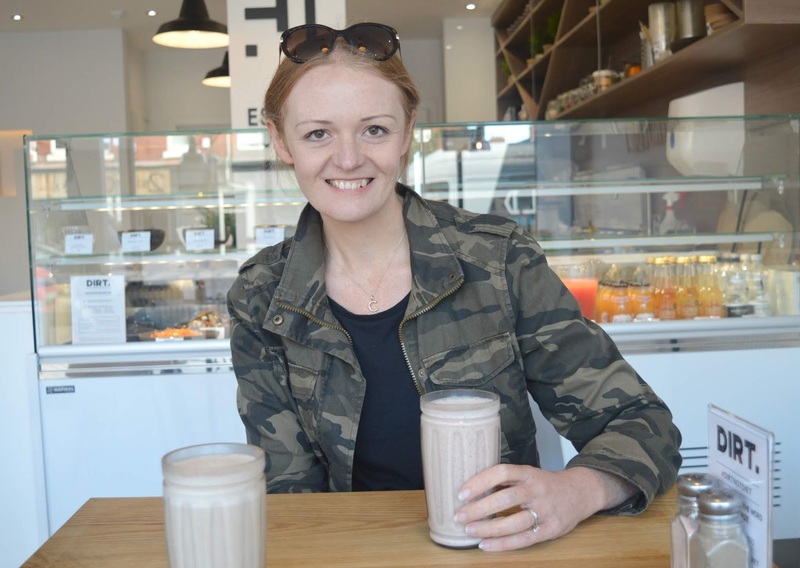 It's not often you leave a restaurant feeling truly inspired but that's exactly what happened to me on my first ever visit to Dirt Health on Chillingham Road in Newcastle. This little place in the middle of Heaton is home to one of the greatest new eateries in the Toon and if you need a refresh, some damn good scran and a whole lot of positive energy believe me this is the place to go. 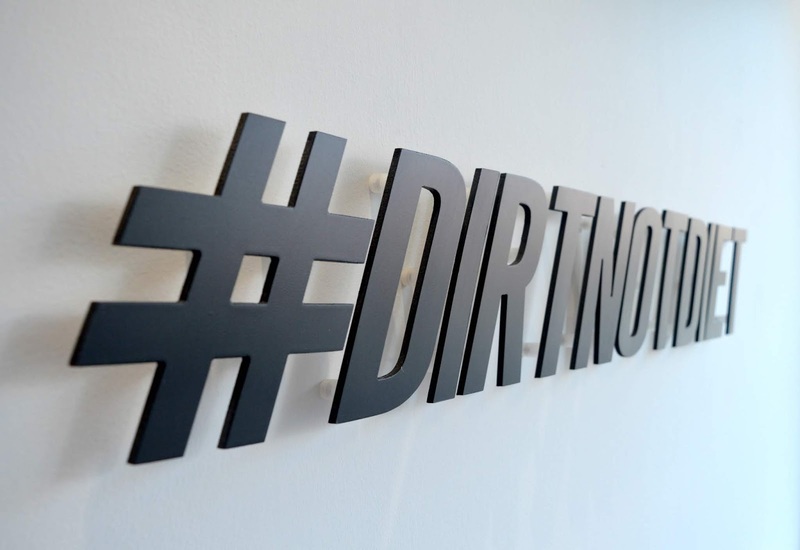 Dirt Health have been on my radar for quite a while now. I've built up a wonderful network on Instagram of locals who share the very best places in the North East and I have to say that most of my "must try" list is now made up of places that I've spotted on Instagram. The colourful dishes at Dirt Health have popped up time and time again and having seen some seriously beautiful breakfasts it was only a matter of time before I got myself to Chilli Road to try one out for myself. Dirt Health is run by lovely lady Jess who is the kind of person you meet once and immediately want to be best friends with. Her enthusiasm for life is infectious and she runs her business with such passion that within moments of stepping through the door you immediately want to join the Dirt Family. The people that work there are some of the nicest people you'll meet in Newcastle (and we all know what a friendly bunch Geordies are!) - they love a chat, make damn good food and provide service with a smile that seems so effortless you know they actually want to be there. Simon and I dragged ourselves out of bed very early on a Saturday morning and made the journey to Chillingham Road, powered by the thought of a delicious breakfast to fuel our busy day. If there's one thing I love at the weekend it's a breakfast that I haven't had to make myself and I had been dreaming of this one all week! Settling down at a table with the perfectly formed menu I managed to get my choices down to four options by the time I made my way over to the counter. Their breakfast menu is so good it is impossible to make a quick decision so I had to run through all of my "maybes" at the till because I desperately needed help to place my order - I'm no good with decisions at the best of times but when a menu has so many of my favourites it's impossible. We decided to start our brekkie off with Smoothies. Simon opted for the Cacao Kick (£4.00) - Coconut Milk, Tahini, Cacao, Dates and Vanilla. I went for the Strawberry Split (£4.00) - Oat Milk, Strawberries, Kiwi, Banana and Raw Honey. Yum! 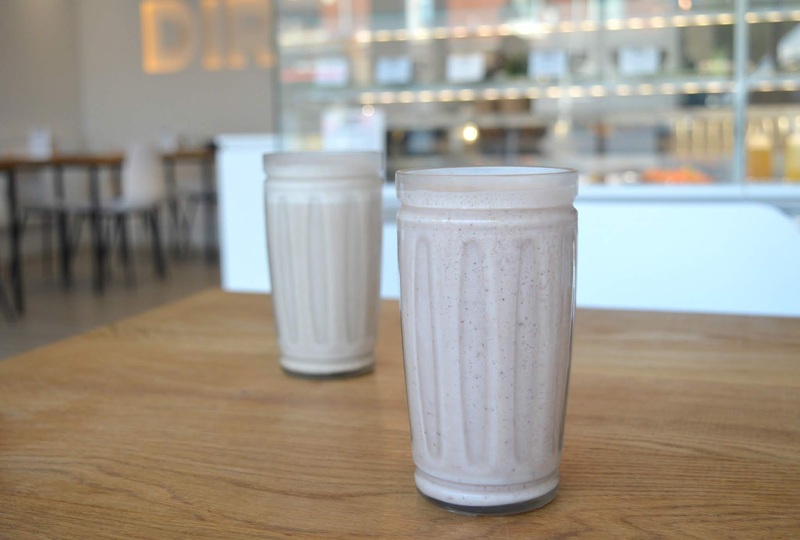 If smoothies aren't your thing then they also serve a range of coffees, organic teas, protein shakes, superfood lattes and cold pressed juices which change daily. 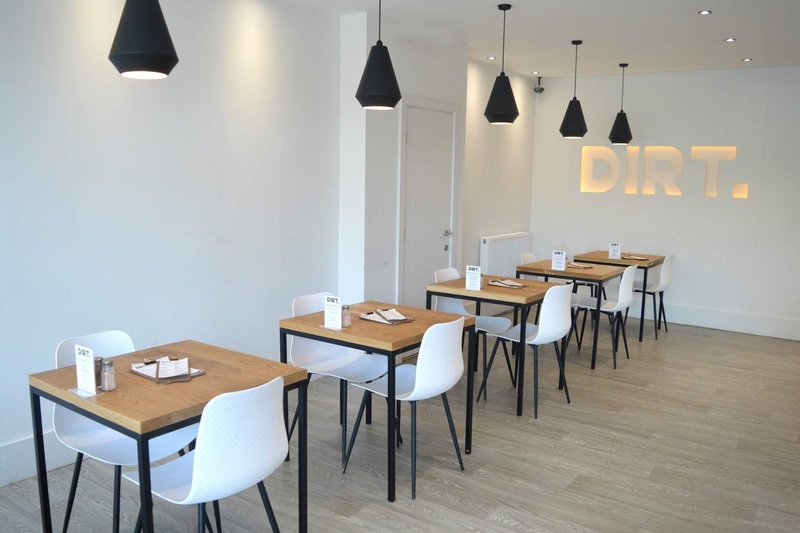 All of the food served at Dirt is made on site from scratch including the sauces and spice mixes and there are no chemicals, preservatives or refined sugars used ensuring that all of the dishes are fresh. 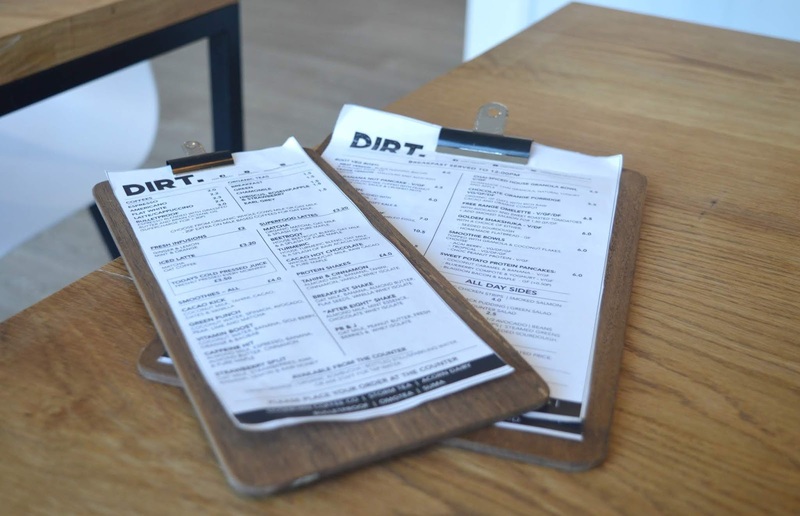 I've heard a lot of people referring to Dirt as a vegan or vegetarian restaurant but they actually cater for everyone and there are plenty of delicious meat dishes on the menu as well as plant based foods. So what did we go for? 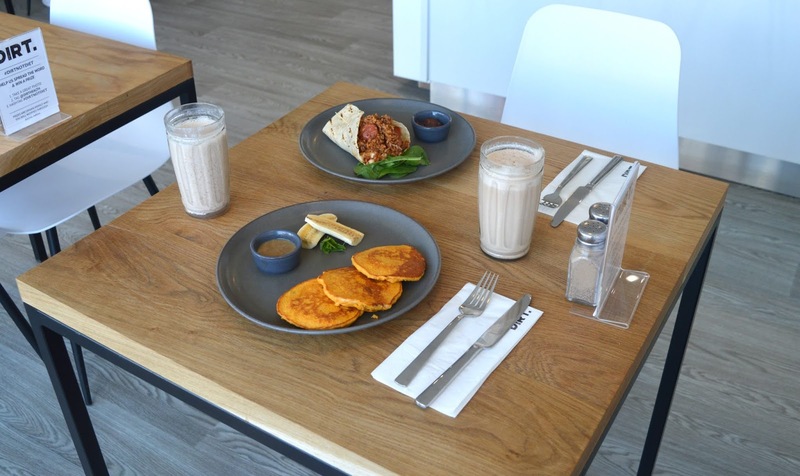 After changing my mind a lot, I eventually decided on the Sweet Potato Protein Pancakes served with coconut caramel and banana (£6.00). I've had Banana Pancakes plenty of times but was so intrigued by the concept of Sweet Potato based pancakes! When my plate turned up I couldn't wait to tuck into my bright orange pancakes! They were really thick and moist compared to banana pancakes and I found them to be far more filling which was good. The sweet potato gave them a lovely natural sweet flavour and they worked so well with the coconut caramel and banana. I'm now wondering if I can work out how to make them at home. I had severe food envy when Simon's food appeared. 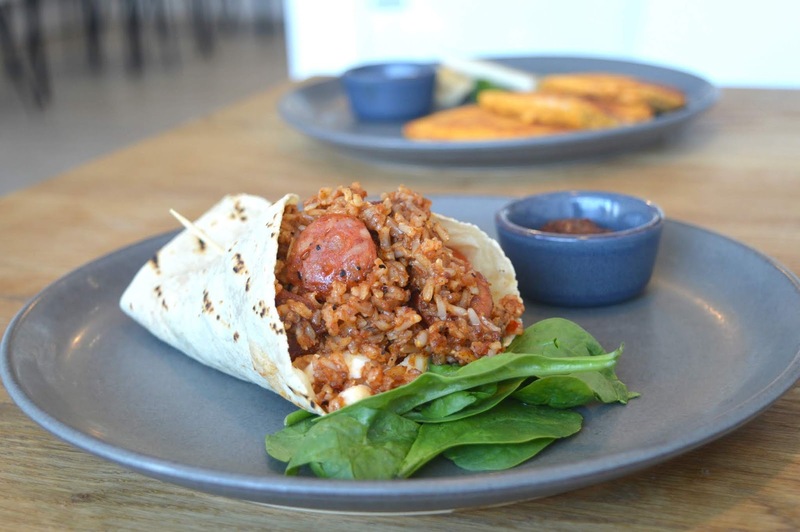 He ordered the Breakfast Burrito (£7.00) - a wrap stuffed full with spicy rice, scrambled eggs, chorizo, salad and house sriracha. The filling was so generous it was spilling out and when I managed to pinch a forkful I was so impressed! If there's one thing Dirt do really well it's creating really delicious flavours, I could have happily tucked in and finished it all off for him. The core values at the heart of Dirt Health are things I think we probably all aspire to hold - sustainability (you won't find any plastic there! ), local (they are passionate about using local produce), health (no nasty diets just delicious fresh nutritious food), positivity and kindness, community and education. As you can tell, I am a bit of a fan, and if you're wondering how on earth you can get all of this from a visit to a small cafe you really need to go and check them out for yourself! It's brilliant and they're really kid friendly too!